The exhibition I’ve been working on with the V&A’s brilliant Museum of Childhood is now open. 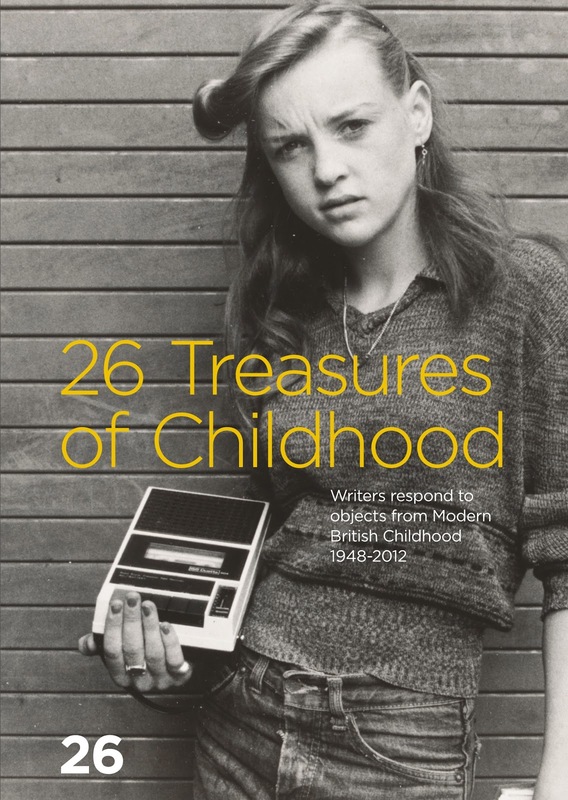 Their idea was to tell the story of post-war British childhood through a series of iconic objects. 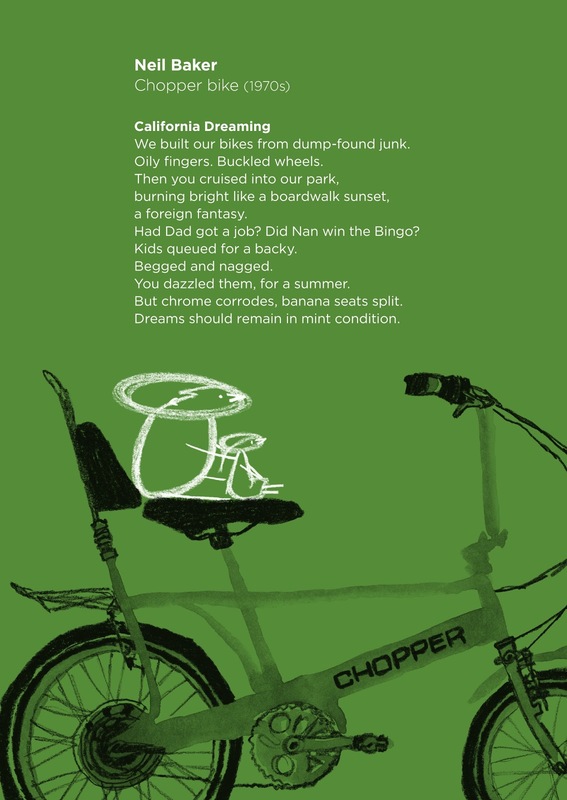 Part of my role was to write a sestude – a sort of 62-word poem – about one of those objects, a Raleigh Chopper bike. 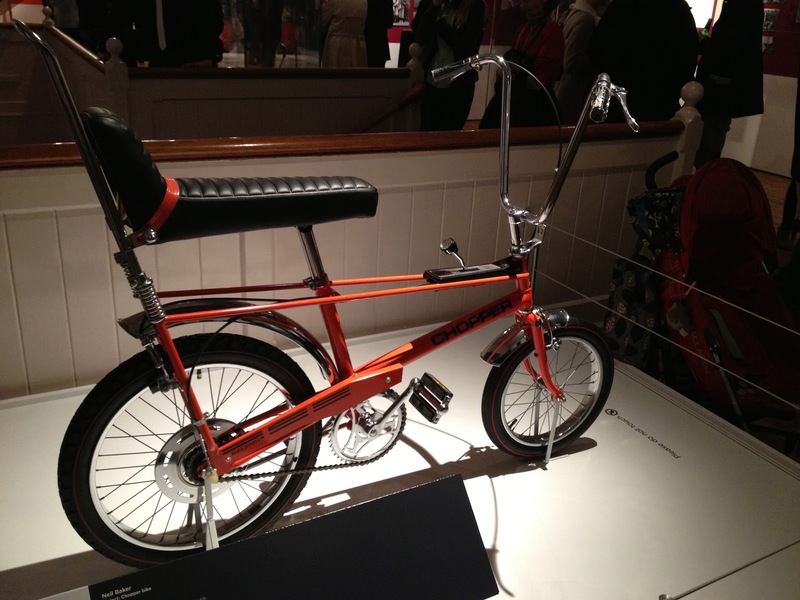 (If you reside on foreign shores, the Raleigh Chopper is an icon – possibly the icon – of British childhood in the 1970s). I also edited a lot of the sestudes written by other writers and ran a blog about it all. My sestude is at the bottom of this page. But as part of the project, I also had to write a ‘creation story’, explaining how and why I wrote whatever I wrote. That’s pasted just below. So, take your pick – read the creation story first, then the sestude; do it the other way around; or close this browser tab and do whatever else might brighten your day. Without further ado, over to me and my creation story…. A Raleigh Chopper. I felt a twist of anxiety when John Simmons told me this was the childhood treasure chosen for me. The museum hadn’t located an actual Chopper yet, but it was bound to be big, bright and popular. If my sestude was boring, it couldn’t be hidden away in a quiet corner. I ought to be grateful, really. Being given such a high-profile treasure was a privilege – or that’s how I saw it. And a bit of fear was a good thing. It added to the creative challenge and gave me a heightened sense of responsibility. But I had another problem. I don’t like Raleigh Choppers and I don’t have happy memories of them. I know many people love them. The Chopper really has become iconic. I imagined museum visitors would want to read something loving and respectful. That wasn’t what I was feeling. I first saw a Chopper when I was maybe eight years old. I wasn’t impressed. They were heavy bikes, and hard to ride. Not just because of their weight; they were badly balanced and prone to tip into an unexpected wheelie, especially when there was a passenger on the back rack – which was most of the time. I also remember them as rusty bikes, with broken gearshifts; owned by flash kids and moneyed kids – and neither label applied to me. My friends and I rode around on bikes assembled from whatever we could get at the council dump. They had buckled wheels, no front brakes. We called our bikes “track bikes” and formed our own gang, The Trackers. There were five of us. I made membership cards. I thought I still had mine in the loft, maybe 35 years old, but I looked just now and couldn’t find it. I wrote my first draft in the foyer of the Royal Festival Hall. I often work there. It’s a good place to fill time between meetings. I decided my sestude would juxtapose the innocent simplicity of our cheap, homemade bikes with the vulgar, commercial faux-Americana of the Raleigh Chopper. Maybe I was feeling grumpy. It all seemed a bit too pretentious, but after much revising and cutting and more cutting, I had a draft I was happy with. I sent it to my editor and she liked it. But I was still unhappy with the tone. It sounded too bitter, kind of whiny. The ending was about rusting dreams. It also seemed to sneer at anyone who ever owned a Raleigh Chopper or who felt affection toward them. I don’t mind making myself unpopular with Chopper-lovers – well, I do a bit – but I do object to sneering. The writing also felt inauthentic. I wasn’t sure whether the “I” speaking in the sestude was me or not. Sometimes I’d tell myself it was me, other times it wasn’t. I started a new draft. The version I ended up with is less bleak and I’m happier with it. I still mock the flash boy cruising around the park on his expensive bike, and romanticise the poor kids on their dump-found scrap. That is drawn straight from my memory, and felt valid. I sent off my finished piece, which is the version that’s now in the exhibition. It was only afterwards, when I was watching the Tour de France on TV with my nine-year-old son, Will, that other memories started bubbling up. Will asked me why it was important for sprinters to “hold the wheel” of their opponents until the finish line was just a few bike lengths away. I explained the benefits of slipstreaming. I am leading Gavin all the way down Garth Road – as usual – when we get to the crematorium. This is where he always makes his move, coming off my wheel and accelerating away on the beautiful yellow racing bike that he built in the shed with his dad. But this time I think it will be different, that I will win. Why did I think I had a chance? It was only now that I pictured in my mind’s eye the bike that I was riding. It wasn’t a cobbled together assemblage of dump-found junk – the kind of bike I rode in my sestude. No, it was a very classy 10-speed Peugeot racer, a birthday gift from my parents. It must have cost them a small fortune. The poseur on the fancy wheels was me. I hereby apologise to the boy on the Raleigh Chopper. A footnote: after writing this I Googled “Gavin Costick”. He became a very accomplished bike racer and still competes for his club. Chapeau, Gareth! We built our bikes from dump-found junk. Had Dad got a job? Did Nan win the Bingo? Kids queued for a backy. You dazzled them, for a summer. But chrome corrodes, banana seats split. Dreams should remain in mint condition. Enjoyed this glimpse of the process and the sestude you ended up with. The exhibition sounds ace also. Makes me wish I was in the UK.